From the outset the intention was that the magazine should feature the contribution made by the women of the parish and, in particular, those ‘in uniform’. 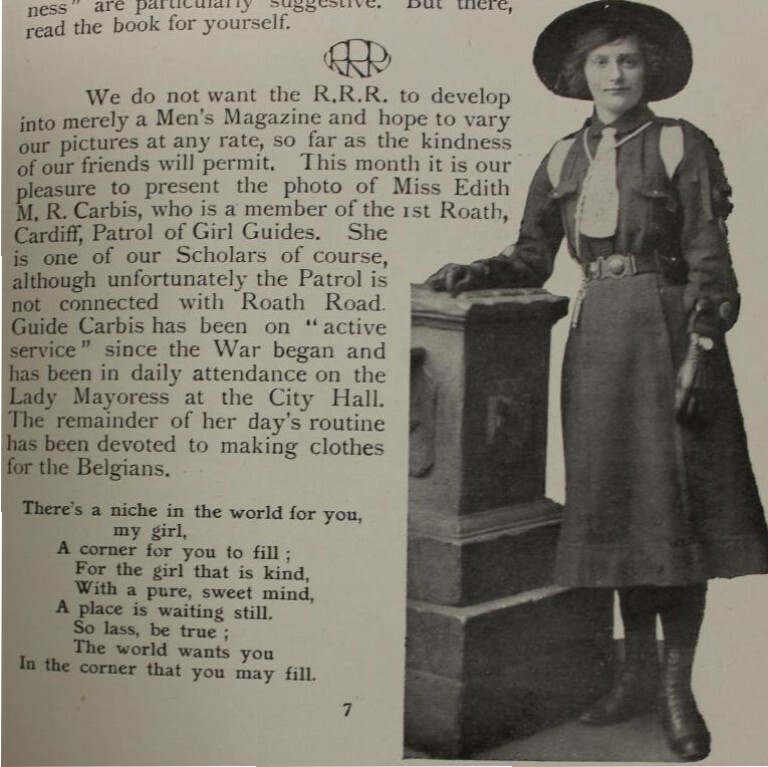 Altogether, the magazine included details of 19 women from the Roath area. Many were sisters of serving soldiers, sailors and airmen and the magazine included photographs of 17 of the 19 and several letters. Referred to in the magazine as ‘our Lady Roamers’ the short pen pictures featured over the coming weeks provide an insight into how the war resulted in women moving into roles and occupations previously dominated by men. At the outset of the war possibly the most obvious route for women looking to contribute to the war effort was to take up the call for volunteers made by both local charities and national bodies such as the Red Cross. Seven of the women featured in the magazine took this route. However, later in the War, as a result of the shortage of manpower following the introduction of conscription in 1916, opportunities opened up for women in many new areas of work. By 1918 Lady Roamers were also to be found in the Women’s Army Auxiliary Corps, the Royal Air Force, the Land Army and local services including the railways and the post. Furthermore, from their letters we know that several served overseas. Two of the most interesting photographs were of Lizzie Veal and Annie Sanders wearing the uniforms of the Great Western Railway and the Postal Service respectively. By the end of the war such sightings would have been commonplace in Cardiff as women stepped increasingly into roles previously monopolised by men. We cannot be sure but this could be Elizabeth Jane Veal from Adamstown. If so, there was a family link with the railway in that her brother, George, was a railway wagon builder. Although women had been employed by the GWR before 1914, the numbers increased rapidly from 1914 onwards to fill the gaps left by men called up for the armed forces. 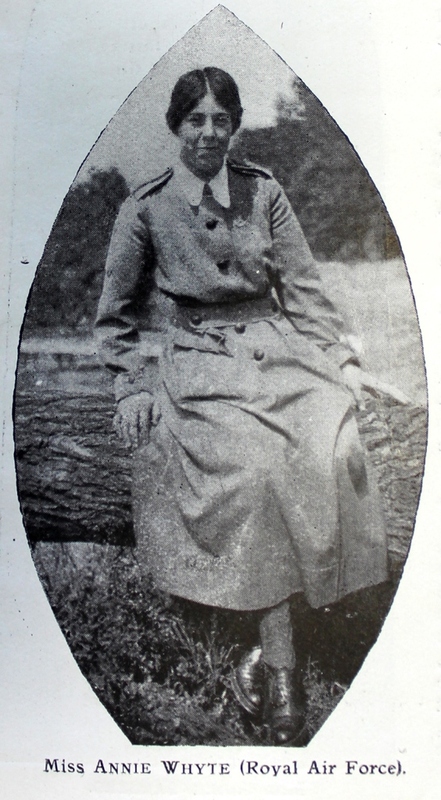 The picture of Lizzie Veal was featured in ‘The Roamer’ in April 1919 (Vol.54, p.2). At that time she would have been one of over 1000 women employed by the GWR as porters and ticket collectors. Unfortunately, ‘The Roamer’ also tells us very little about Annie Sanders (Vol.51, p.5). She may well have been Annie Sanders of Treharris Street. 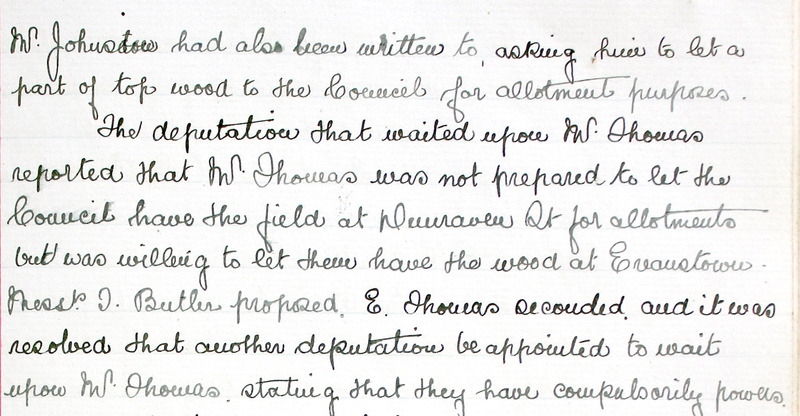 If so, Annie’s husband George was a tailor and she would have been 29 at the outbreak of war. She was photographed, complete with sack of letters, in the blue serge skirt and coat and blue hat of the postal service, introduced for women in 1914. Finally, mention should be made of the first and youngest woman to feature in ‘The Roamer’, Edith Carbis. ‘We do not want the RRR to develop into merely a Men’s Magazine and hope to vary our pictures at any rate, so far as the kindness of our friends will permit. This month it is our pleasure to present this photo of Miss Edith Carbis, who is a member of the 1st Roath, Cardiff, Patrol of Girl Guides. She is one of our scholars of course, although unfortunately the Patrol is not connected with Roath Road. Guide Carbis has been on ‘active service’ since the War began and has been in daily attendance on the Lady Mayoress at the City Hall. The remainder of her day’s routine has been devoted to making clothes for the Belgians’ (Vol.3, p.7). 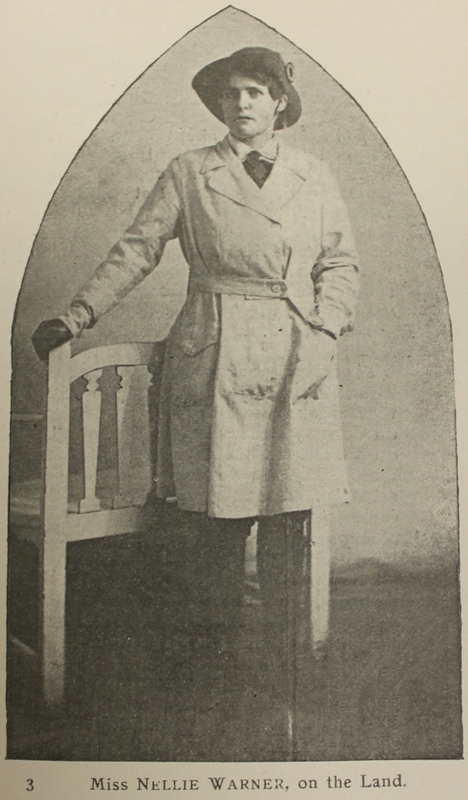 Despite the good intentions, other than the references to Nurse Alice Williams later in 1915, it was not until March 1918 that ‘The Roamer’ began to feature, on a regular basis, the photographs and details of women from Roath. It had taken some time to accept that women could steps into roles previously dominated by men. Although for many the new opportunities were short lived, no one could doubt that attitudes to work and male and female roles would never again be the same as a result of the wartime experience. Perhaps one of the most striking photographs is that of Annie Whyte in the uniform of the Women’s Royal Air Force (WRAF). ‘Canada, Africa South and West, Spain Portugal and Mauritius, Ceylon, Jamaica, Bermudas, Adaman Islands and Straits Settlements. Can any Roamer beat it?’ (Vol.41, p.4). ‘We are about 3,000 miles inland on a river that runs into the Volga…. I have all the Roamers up to date. I see my sister Annie’s photo in one of them. I suppose most of the Roamers are home now. I don’t know when I shall arrive’ (Vol.57, p.6). As with many women in the services, Annie’s horizons were much more limited. She joined the WAAC initially and transferred in April 1918 to the newly formed WRAF. She worked primarily at the Royal Flying Corps Armament School at Uxbridge as a waitress and was later promoted to forewomen waitress. Annie’s experience would have been similar to many others, with work options limited, initially, to clerical work and household duties. However, to release more men the number of opportunities open to women, including technical trades, was steadily increased. Annie would have served in Britain given that it was not until March 1919 that the first group of WRAFs went overseas. The WRAF was disbanded in the latter half of 1919. The formation of the Women’s Army Auxiliary Corps (WAAC) in 1917 was a significant milestone in accepting that women could undertake roles within the Armed Forces other than nursing. 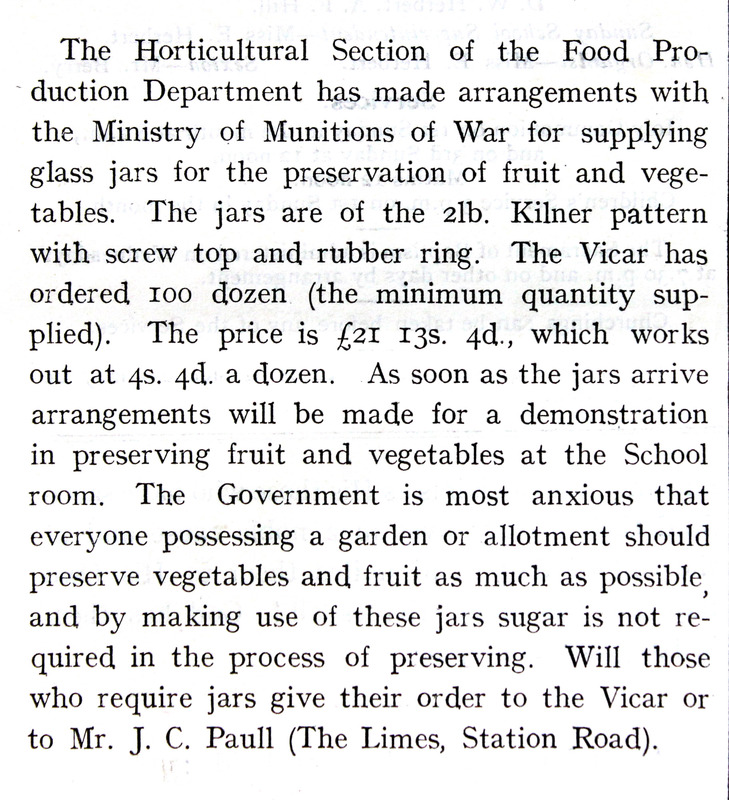 While the Land Army, although organised on military lines, remained essentially a voluntary and domestic body, the WAAC was more akin to an army unit. Six of the Lady Roath Roamers were photographed in WAAC uniform. May Kear and May Brooks were in the distinctive brown gabardine coat frock and round broad brimmed felt hat of the WAAC. 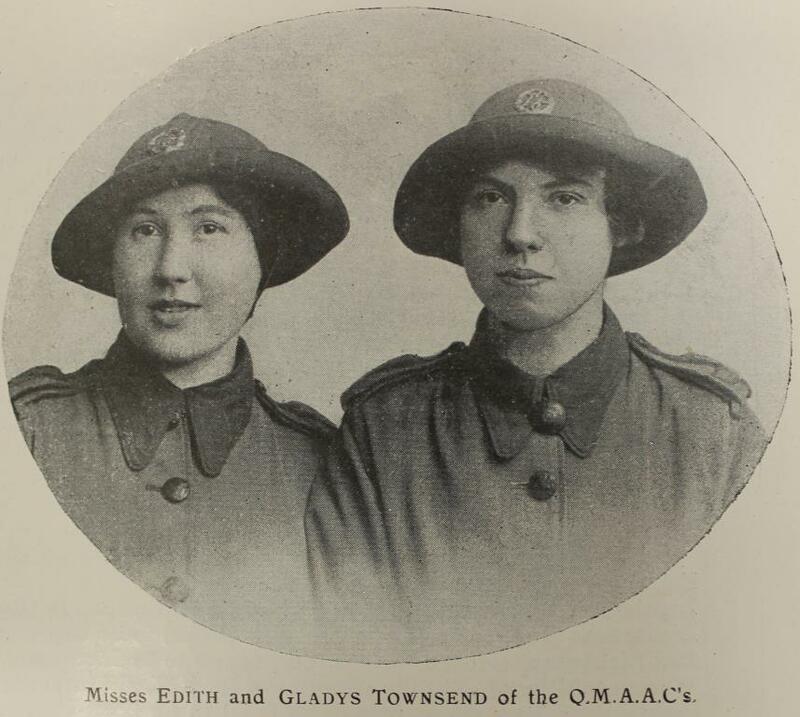 By 1918 the WAAC had become Queen Mary’s Army Auxiliary Corps (QMAAC) and two sisters, Edith and Gladys Townsend, were pictured wearing the uniform of the QMAAC. Like many of the Lady Roath Roamers the sisters had a brother, Fred, serving in the Army. ‘Well we have done some travelling since we first joined up, spent the first three weeks at Kimmel Park as Mess orderlies, we felt like old soldiers, then we had a month at the training camp at Abbey Wood, near Woolwich, experienced three air raids there, no damage was done anywhere near us although we were very excited. From there we were sent to Newcastle, made a stay from the Thursday before Good Friday until Easter Tuesday, did two Church Parades, one on Good Friday to the Parish Church, the second one we marched from Bensham Workhouse to the Cathedral. We enjoyed both services very much. Bensham Workhouse is the hostel where we were stationed. Being holiday time we were able to have a good look around and enjoy ourselves, we thought Newcastle very much like Cardiff, so felt more at home there than we have at any other place. Arrived at this camp on Easter Tuesday afternoon about 4 o clock, just about fagged out after travelling all day. Felt very strange at first but now we have settled down and know the ins and outs of the different Messes and like the life very much’ (Vol.44, p.6). We know from May Brooks’ service record that her life in the WAAC followed a similar pattern. May Brookes worked at a number of army bases in the south of England. Like thousands of others she contracted influenza during the epidemic that swept the country in 1918, spending a week in hospital. She was discharged on compassionate grounds in June 1919. As with many advances made by women in 1914-18, the WAAC was seen as primarily a response to the war and in 1921 its successor body, the QMAAC, was wound up. Two of the Lady Roath Roamers, Nellie Warner and Dorothy Brixton, were pictured wearing the distinctive uniform of the Women’s Land Army. The Brixtons were a local family from Treharris Street, Roath. Dorothy helped with the Sunday School at Roath Road Church and had three brothers who all fought in the First World War. James Brixton was awarded the Military Medal in 1917 for bravery while on service in the field in September 1916. It was later confirmed that this included bringing in a wounded officer under heavy shell fire (Vol.27, p.3 and Vol.43, pp.3-4). The award was made at a public presentation in Cardiff on 26 November 1917. Her brother, Alfred, was also awarded the Military Medal later in the same year (Vol.38, p.8 and Vol.39 p.2). It was perhaps not surprising that, with her brothers in the armed forces, Dorothy took up the opportunity to enrol in the Land Army. 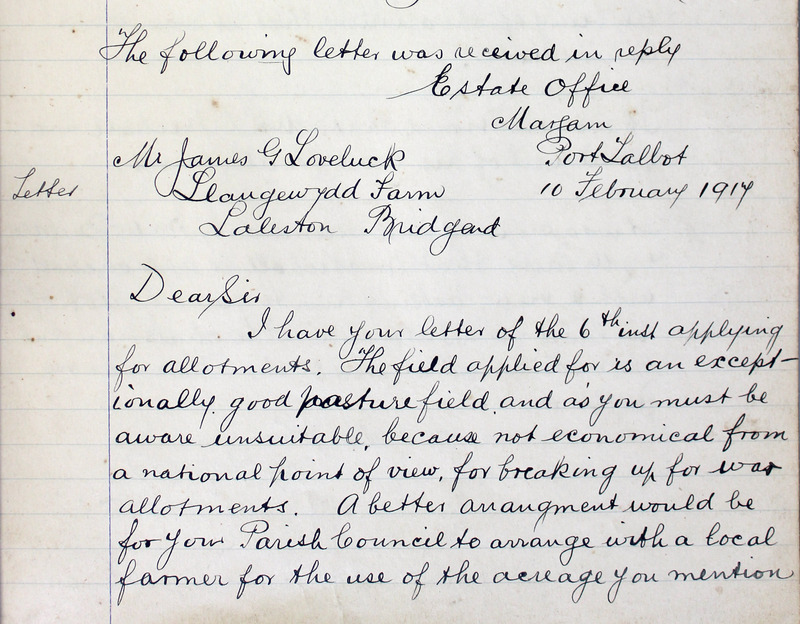 Formed in March 1917, the Land Army was a direct response to the need to boost food production by providing additional labour for farms throughout Britain. Over 20,000 women volunteered for a minimum of 6 months. Volunteers were assigned to one of three sections – agriculture, timber cutting and forage. 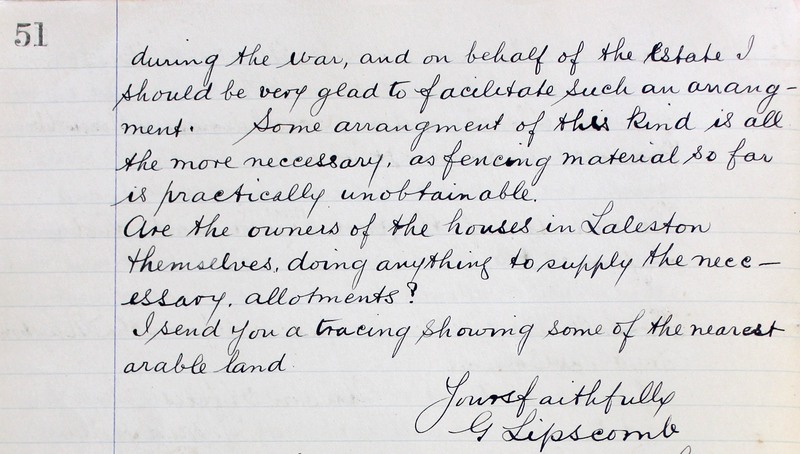 It is likely that Nellie and Dorothy lived at home and were in the agricultural section. If so they would have tackled the full range of farm work from milking and looking after livestock to planting and harvesting of crops. While nursing was seen as natural contribution for women to make to the war effort, the Land Girls in their breeches, knee length tunic and felt hat were seen as a very different proposition. Very little information is provided in ‘The Roamer’ about Nellie Warner. Like many Cardiff women, Dorothy and Nellie would probably have worked each day at farms surrounding Cardiff. The Land Army was not an easy option. With the glamour of the uniform came the prospect of long hours and back breaking work for 18s a week. 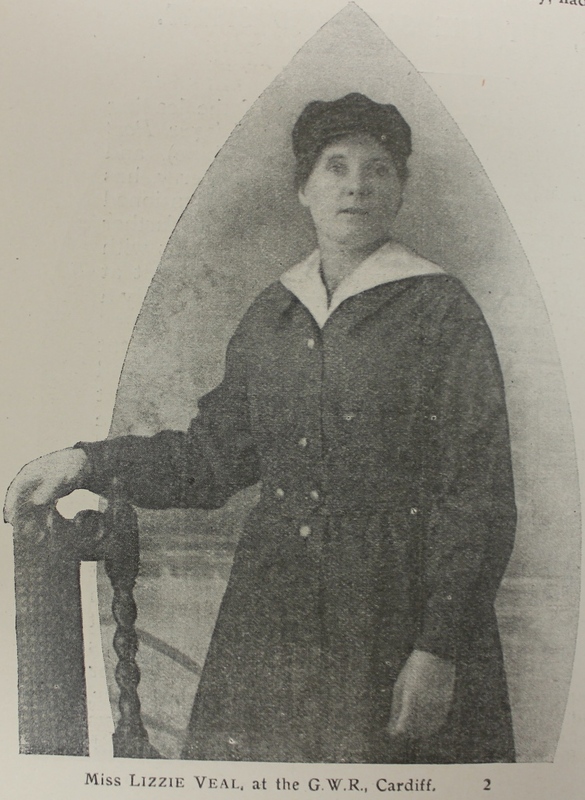 ‘On Friday 12th July last, in the Council Chamber of the Cardiff City Hall, amongst other local ladies who received a beautifully designed Badge in appreciation of War Services rendered on behalf of ‘that splendid fellow, the British Soldier’, was Miss Muriel Ingram, the sister of the Roamer who appears on our first page. 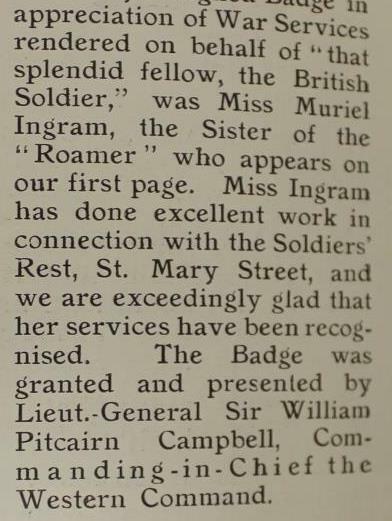 Miss Ingram has done excellent work in connection with the Soldiers’ Rest, St Mary Street, and we are exceedingly glad that her services have been recognised. The badge was granted and presented by Lieut-General Sir William Pitcairn Campbell, Commanding-in chief the Western Command’ (Vol.46, p.2). The brother referred to was Geoffrey Ingram who served with the 14th Battalion of the Welsh Regiment and was wounded in the latter months of the War. During the course of the War over 90,000 men and women responded to the call by the Red Cross for volunteers. Each county set up Voluntary Aid Detachments (VADS) made up of volunteers. The VADs undertook a range of work including nursing, transport and organisation of rest stations. Six of the Lady Roamers volunteered for the Red Cross. The most dramatic stories were provided by Alice Williams and Lilian Dove both of whom served overseas as nurses. ‘Miss Alice Williams, who has a lifelong connection with Roath Road, is a Red Cross Nurse in a French Field Hospital, where the wounded are brought in straight from the trenches for immediate attention. Our only lady at the Front!’ (Vol.13, p.6). ‘Miss Williams has been in the thick of things – as a nurse for two years, and this is the first time she has left France. Much of her time she has spent within three miles of the German trenches so she knows something about things and has an interesting story to tell. She kindly showed us a bit of a Zeppelin that she saw brought down outside Paris. We believe that she is going back and wish her every success in the splendid bit of work she is doing’ (Vol.32, p.6). ‘The many ‘Roamers’ by whom our former Minister, The Rev C Nelson Dove, is still held in such affectionate regard, will be thankful to hear that his daughter, Nurse Lilian Dove, who was ‘mined’ off Alexandria on 31st December last, was rescued and is apparently none the worse for her unsought adventure and the exposure, shock and explosion, except that she unfortunately lost all her belongings’ (Vol.41, p.8). Nine months later the Roamer reported that she was still in Alexandria. The information was provided by Driver George Notley, a fellow Roath Roamer, who was also in Egypt. He had sent Lilian a card signed ‘Notley one of the RRRs. She recognised the ‘Freemason’s sign’ and they had a cheery interview’ (Vol.47, p.2). Photographs of two other Lady Roamers, Rose Crowther and Beatrice James, were provided in their Red Cross nurses uniforms. 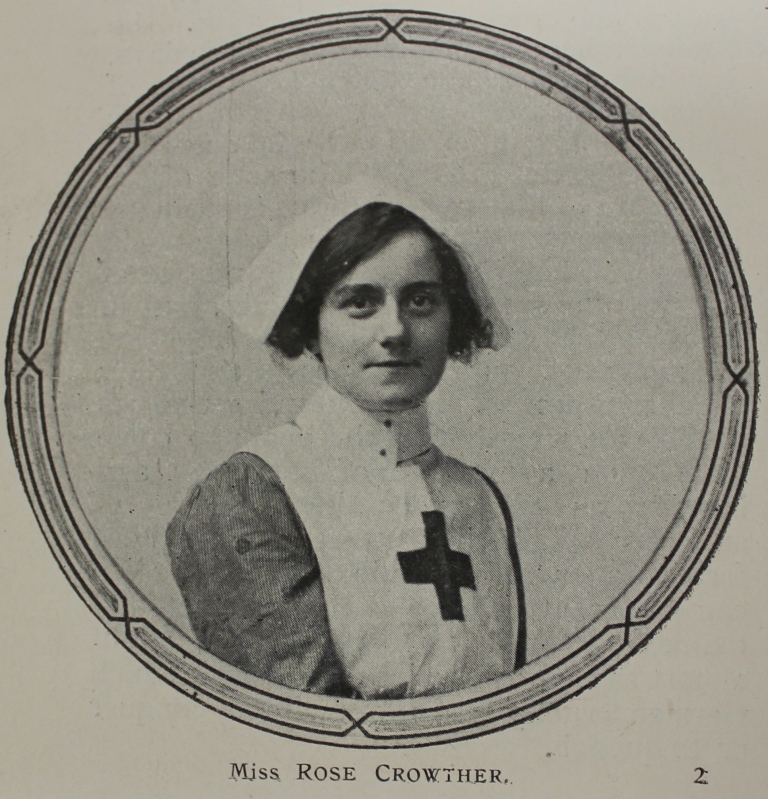 It is likely that Rose was the sister of Charles Crowther who was a Sapper in the Royal Engineers. We know from Red Cross records that Rose joined the Red Cross on 3 June 1916 but no details were provided of where she and Beatrice were stationed. Two others, Harriet Thomas and Florrie Pearce, are pictured in overcoats and caps. It could well be that when the photographs were taken they were working at one or more of the Auxiliary hospitals set up by the Red Cross during the war. In total the Red Cross set up 49 Auxiliary hospitals in Glamorgan alone. Often using large houses made available by their owners, the hospitals provided rest and recuperation for servicemen recently discharged from the large military hospitals. However, as with Alice Williams and Lilian Dove, service was not limited to the Home Front and Florrie Pearce certainly served with the Red Cross overseas and probably in France.